Groceries and gas are necessary purchases each month so why not earn while you spend! 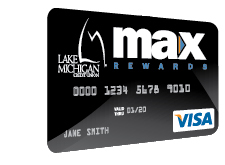 Use the LMCU Max Rewards card and earn 3%* for all gas purchases, 2% on all groceries and 1% on everything else. The Max Rewards card has no annual fee, no balance transfer fees, and the ability to redeem points for cash, travel or merchandise. With your first purchase, you’ll receive 1,000 points and when you reach $500 in purchases, you will receive an additional 5,000 points! That means $60 in your pocket simply for buying the things you already need! Apply for your Max Rewards Card today. Just call, click or visit any branch. *Cash advances not included, 12 months begins from date of account opening. Maximum earned on first $500 spent on gas/mo., 1% after maximum is reached. Excludes existing LMCU balances.